Aromatic Tatar Buckwheat tea "Maylisha" made from high quality Tatar buckwheat, which grows at high altitudes in Inner Mongolia. Tatar buckwheat is rich in easily digestible proteins, fats and complex amino acids, fiber, pectin, lemon and oleic fatty acids, vitamin A, E, B, PP, rutin (vitamin P), quercetin, Mark and trace elements - iron, calcium, potassium zinc, magnesium, copper, selenium, phosphorus. Tatar buckwheat tea contains no gluten! Aromatic Tatar Buckwheat tea is a healthy drink that nourishes and energizes the body, maintain acid-base balance, helps maintain normal concentration of blood sugar. Buckwheat tea fuels contribute to the normal functioning of the gastrointestinal tract and fat metabolism, contributes to normal blood microcirculation. Blabogpriyatno affects the normal enters a fail of the skin, hair and nails. Nutrients in bitter buckwheat promote energy exchange in the body. 5-10 g. (1-2 teaspoons) of the product is placed in a cup and pour hot water, then brew 3 min. It is the same amount to be brewed several times sledko here beans are consumed by desire or be added to other grains. 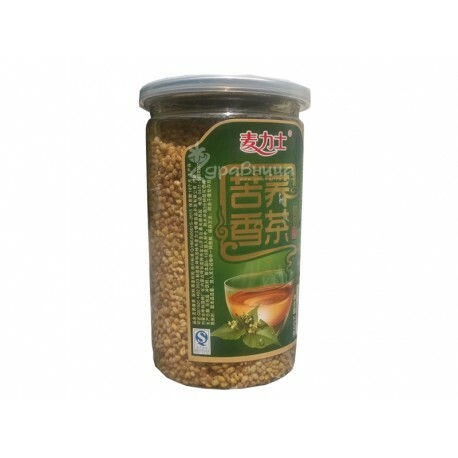 Tatar buckwheat can be combined with Lycia, chrysanthemum, cassia seed, jasmine, and other herbs. Tea can be cooled and be consumed cold, especially suitable for summer days, for better flavor can be added lemon. Can be consumed directly - grains are aromatic, crispy and delicious. Grains of Tatar buckwheat (Fagopyrum Tataricum, Tartary Buckwheat) - 10 g.